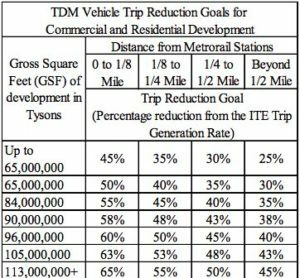 One of the “guiding principals” of the Tysons Comprehensive Plan is a reduction of surface parking and moving vehicles through Tysons to drive pedestrian and bicycle traffic. But at Bisnow’s Tysons State of the Market event last week, local developers said that utopian plan isn’t really shaping up the way it’s designed. Brian Tucker, managing director for JLL, said changes in how space is filled in office developments has impacted local parking more than the comprehensive plan accounted for. The comprehensive plan lists a number of strategies to wean Tysonians off their cars — including adding transit infrastructure and encouraging teleworking — but the plan also calls for a reduction over time in the ratio of parking spaces to the commercial floor area. A chart in the comprehensive plan shows a scale of vehicle trip reduction goals connected to the amount of gross square feet of development in Tysons. In the past, each development was required to provide parking for its own peak demand, an approach that often leads to excess parking supply and a wasted uses of resources. In 2015, the Tysons Parking Study estimated that Tysons had 110,000 parking spaces. This amount of parking far exceeds what is necessary. 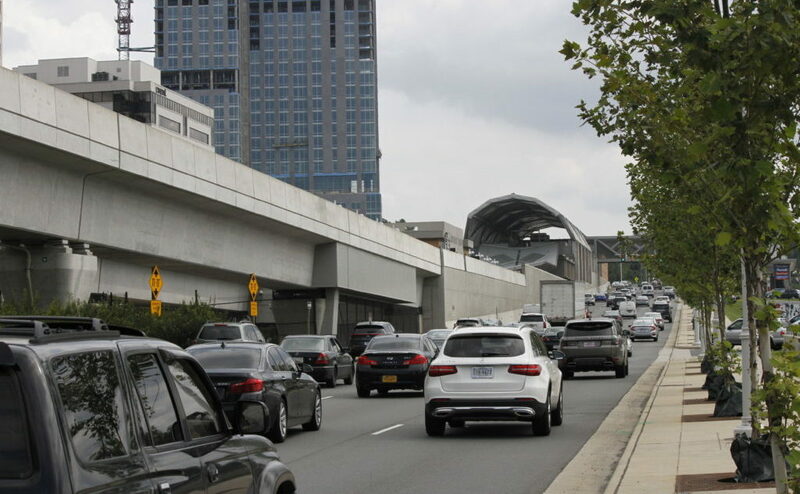 The comprehensive plan calls for parking in Tysons not to be supplied for individual use but regarded as a common resource for multiple uses. But Tucker says those maximums are concerning to real estate developers. Donna Schafer, managing director for Cityline Partners, said the vision of a car-free Tysons is going to take time to implement and more flexibility should be offered to offer temporary parking options, like “throwaway parking decks.” According to the Tysons Annual Report, a 711-space interim commuter lot was built in 2014. A stury of this lot in 2018 found that 558 of the spaces were filled on an average weekday. Mark Carrol, executive vice president of Skanska Commercial Development, said driving around Tysons is part of the area’s DNA.